The system monitors and verifies each temperature in the grain mass, analyzing its variations and the consequences for the health of the grain and its final moisture. The GARTEN system determines the conditions of the micro-climate created inside the silo, the temperatures at the various points of the thermometric cables, while a complex Physical-Mathematical modeling algorithm determines the level of the product and the humidity of the grains in different layers, from the bottom of the silo to the top, by Thompson's method. With the GARTEN system of automated thermometry we can prevent the conditions favorable to the development of fungi and insects so we eliminate the damages caused and we obtain a healthy product. System: "dry-aeration". In this system the product can be introduced into the silos with up to 17% humidity and reduced by the use of the aerators to a desired programmed value (13% for example).Moisture Reduction: Daily monitoring of moisture reduction of the stored product without the need to perform samplings. Product Level: Determines the level of the product in the silos, without the need for manual counts. Unit control and Temperature: Allows you to control the relative humidity of the air and the ambient temperature of a weather station. Scanning System: It allows to evaluate the sensors inside the silos, using for control effect only those that are immersed in the mass of grains. Product Control System: Eliminates losses by excessive aeration, by controlling the temperature in the grain mass, together with the data read in the Meteorological Station. - Design data of the aerators (air flow, pressure). - Temperature of each sensor within the grain mass. - Cereal level inside the silo and quantity of the cereal. Electric energy: It saves electricity by using the aerators only when needed and doing the blocking at peak periods, where energy is more expensive. - It works in automatic, controlling day and night the quality and sanity of the grains. - Reports of all temperatures in the silos and central weather station. - Safety of stored grains. - Operation with commands very easy and intuitive. - Programmed with all grain conservation technology. - Control system based on large Siemens Programmable Logic Controllers. - Allows secure internet connection for monitoring or interconnection with Database. 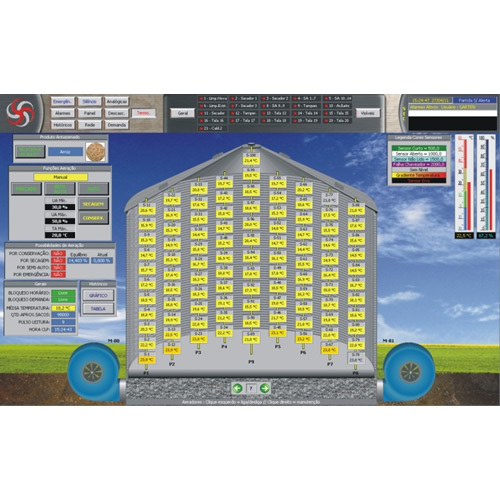 - Screens of temperature history, aeration of each silo recorded in databases.